[By Nick, discontinued] Hey look, it’s another product that got lost in my backlog! 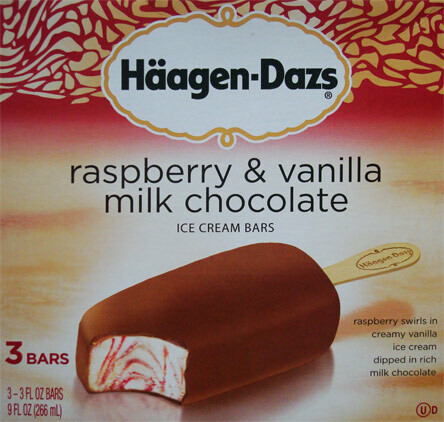 These are the new (for 2012) Haagen-Dazs Raspberry & Vanilla Milk Chocolate bars. I’m a sucker for novelty bars and you don’t see raspberry used all that often when it comes to novelties so I easily picked these up when I saw them. Seeing as this review is well over due, let’s skip right to the product. Taking a bite, you’re immediately hit with the high quality milk chocolate shell. That flavor quickly transitions into a very potent raspberry flavor. When I say potent I really mean it. The raspberry swirl is perfectly tart and sweet. It’s actually one of the best representations of fresh raspberry flavor I’ve ever experienced in ice cream. Now the milk chocolate does reappear in the after taste but the vanilla ice cream is completely lost among the mix. Being that I love raspberries, I have no problem with them taking over the show. While some fruit swirls can tend to be icy, there’s none of that here either. As you’d expect with any Haagen-Dazs bar, the quality of the ice cream was great. It’s creamy, dense, and all that jazz. Sure the vanilla is muted by the raspberry but it does its job just fine. There’s really not much else I can say about this bar. If you’re craving raspberries you should definitely give this one a try. 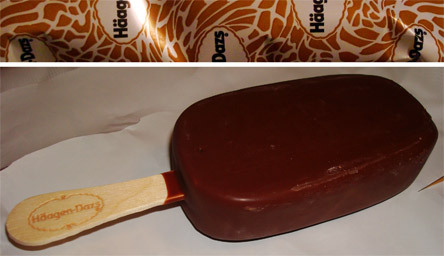 This post reminds me of the first ice cream bar I remember having. 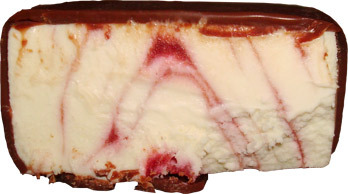 It was in the 5th grade at the San Diego zoo and it was the HD raspberry and cream bar. Shocking to me why I have only gone into the stores and gotten half gallons since then. I think that needs to change after seeing this review! Danielle, let us know what you think when you try a bar!